We at, Adios Holidays, realize the importance of a happy stay during the vacation. This triggers us to give you the best possible accommodation, with in your budget. Be it 5 Star Hotels, 3 Star Hotels, 2 Star Hotels, Guest houses, Luxury Resorts, Motels or Cottages- we can book anything for you at the earliest. Our experts always ensure that your comfort and luxury are no way sacrificed in the entire process. 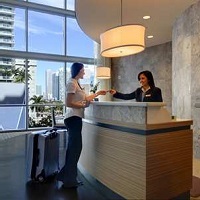 We are a reliable Hotel Booking Agent in Delhi, India.